Twitter has introduced Instant Unlock Card to its conversational ads, which are rolling out to all advertisers on Thursday after a seven-month beta. SAN FRANCISCO: The social media platform introduced conversational ads – which contain call-to-action buttons, inviting users to share personalised versions of a brand’s content with their own followers – in January, alongside another advertising option, Promoted Moments. Twitter said that during the beta stage, the brands using conversational ads had achieved a 34% earned media rate – meaning for every 100 paid impressions, they achieved another 34 earned impressions from their content being shared by users interacting with their ads. The new feature, Instant Unlock Card, allows an advertiser to hide exclusive video content behind the ad, which can only be unlocked once a tweet has been sent using the ad’s response button. 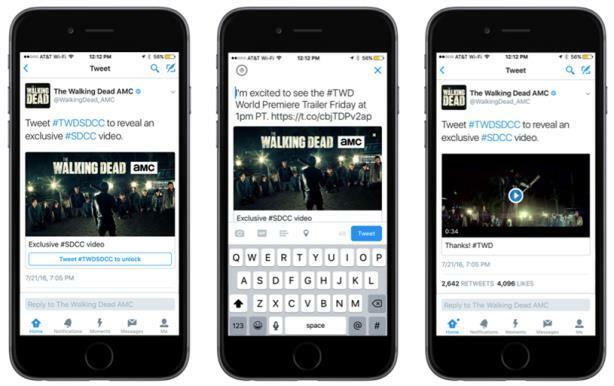 Twitter is also introducing advanced analytics for conversational ads. One of the first brands to use the Instant Unlock Card was U.S. cable TV channel AMC, which sought to increase online conversation about The Walking Dead for Comic-Con in San Diego last month. AMC created an exclusive trailer for the show, only available to be viewed on Twitter through an Instant Unlock Card ad. "In a crowded environment, this powerful new feature helped us keep the number one show on television top of mind and give fans at Comic-Con and beyond what they were hungry for – more of The Walking Dead," said Suzanne Park, VP of marketing at AMC.